Crafty Little Beana: My current projects. I am trying to finish up a couple of swaps. This is a WIP for the apron swap. It has been so hard so hard finding time to work on these with everyone being sick here. This little summer tote and beach towel is for the Not too Shabby Summer Swap. It is ready to post, but with Adler sick I haven't been able to get to the post office. I need to post a better pic. The bag turned out super cute! You can't tell in this picture though! Your bag and towel is a great idea! I love your embrodiery too! Your daughter is so cute and she looks like she is a lot of fun! Sweet embroidery. And love the bag. I love the bag! And the matching beach towel! Fantastic idea and the colors are wonderful! 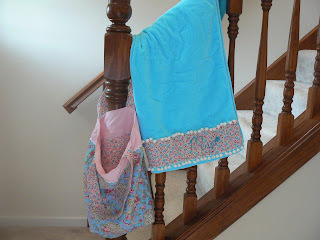 I hope my sewing approves and I can make beautiful projects like yours! Thank you for the apron! It arrived in the mail today and I was so pleased to have something so adorable. 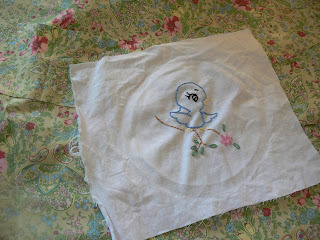 The little duck you embroidered was darling and reminded me of the napkins and pillowcases my great grandmother had embellished when she was a young mother. I promise to cook in it tonight! Thanks again! sorry, I meant to say the little "bird" you embroidered. sorry!